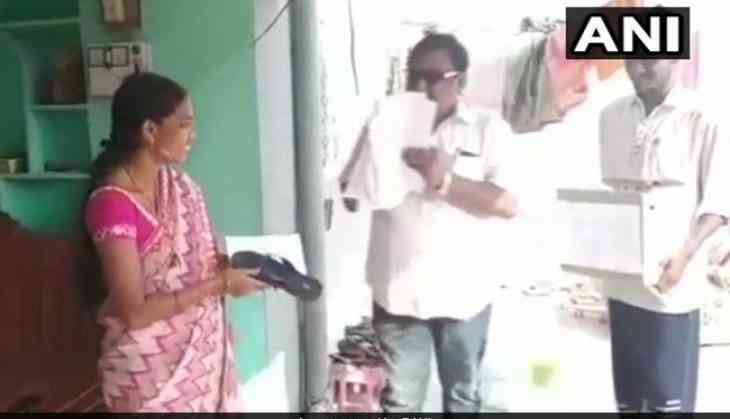 A strategy by an independent candidate Akula Hanumanth has given a shock wave across the state when he gave slippers to the people to beat him, if doesn’t performs well. The Telangana Assembly election is scheduled for December 7 and the step by Akula might garner some votes for him, as he is contesting the election as an independent candidate and it will be tough for him to defeat the incumbent TRS. The candidate is contesting from Korutla constituency of Jagtilal district in Telangana and its being seen as a rare of rare strategy to move the voters. Akula is also handing over a letter, which is actually his resignation letter from the legislative assembly, if doesn’t performs or fulfill the promises he has made in the manifesto. The letter is a future letter which every voter in his constituency is receiving. The current 117 member assembly in the Telangana has 63 lawmakers of the Telanagan Rashtra Samiti, 22 of the Congress and the BJP has 9. The election in the 119-member assembly in Telangana is scheduled for December 7 in a single phase, and the results will be announced with other state election, on December 11. The election in Telangana became a necessity when the chief minister K Chandrashekhar Rao led TRS had dissolved the assembly prematurely, before 6-7 months and the election commission had then called for an election in the state. UPA chairperson Sonia Gandhi, who is yet to debut in the state election rallies, will campaign in Telangana and it will be her first rally this election season.